CD Version – OUT TODAY! Pre-orders are still available for the vinyl version of A Decade Of Dio: 1983-1993, set to release on October 4, 2016. Pre-order yours now via Amazon: vinyl. Retailing at $99.98, the vinyl version comes with a bonus 7″ single. On the first side is the 1983 version of “Evil Eyes,” which was originally released as the b-side on the “Holy Diver” single. In addition, this version is different from the one featured on the 1984 album The Last In Line. The flip side features “Time To Burn,” which was the only studio track featured on the otherwise live release, Intermission (1986). 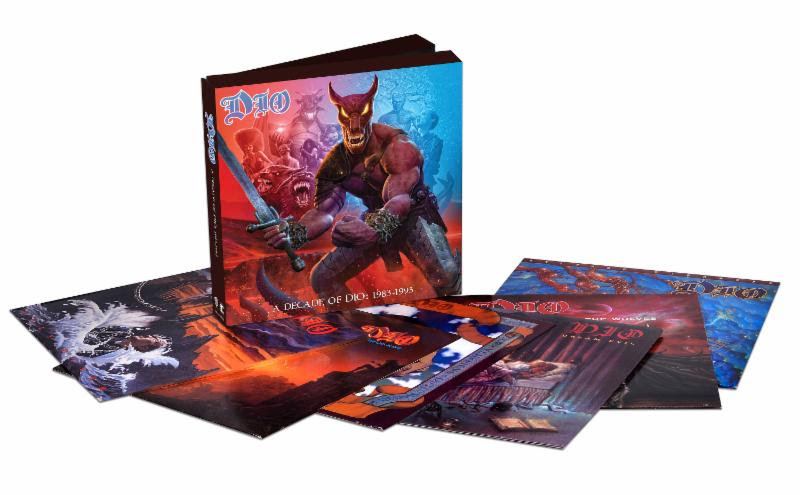 Both versions come housed in boxes featuring new artwork by Marc Sasso, who was responsible for many of the band’s iconic covers. Ronnie James Dio‘s sinister howl and wicked songcraft bewitched hard rock fans in the Seventies and Eighties during his memorable stints with Elf, Rainbow and Black Sabbath.Dio‘s successful solo career led to 10 studio albums and sales of more than 10 million records around the world. In the Nineties, the group released two more stellar studio albums. Lock Up The Wolvesarrived in 1990 and featured the single “Hey Angel” and rocking title track. Following a brief reunion with Black Sabbath in 1992, Dio returned with Strange Highways in 1993. The album featured future fan favorites like “Jesus, Mary and The Holy Ghost,” “Evilution,” and the title track. Although Ronnie James Dio lost his battle with stomach cancer in 2010, his towering voice and legacy live on. The Ronnie James Dio Stand Up and Shout Cancer Fund, co-founded by Wendy Dio, is a non-profit 501(c)(3) charitable fund dedicated to supporting cancer-prevention research, raising awareness and educating the public about the vital importance of early detection and prevention when dealing with this deadly disease.